We open with a father teaching his daughter how to fire a gun. Glass bottles shatter. Pupils dilate. Birds are shot out of the sky. The sun rising over the Virginian Appalachia of yesterday shifts to the setting sun in Oslo, Norway today. From the opening sequence, Butterfly #1 grabbed me and just wouldn’t let go. 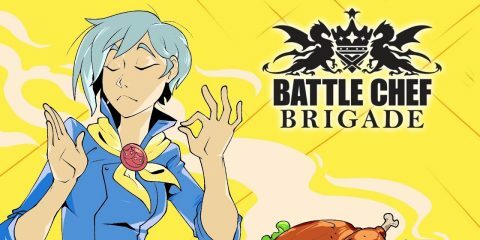 What follows is a riveting opening salvo of terse narration, innovative artwork, and a brilliant narrative twist that promises big and exciting things from this brand new series from Archaia. The premise is fairly straightforward—Rebecca Faulkner is a star operative for the Project valued for her unique “set of skills” (Taken anyone? ): disguise, hand off, cover, retrieval. When an operation goes south, Rebecca quickly determines that she’s being burned by her bosses and she’s forced to revert to another of her skills: escape. A standard spy thriller a la Bourne, but the female lead and the final twist turn Butterfly into an engaging, unique riff on the espionage comic. Developed from a premise by screenwriter Arash Amel (Grace of Monaco and the long-rumored I Am Legend 2), Butterfly is written by industry up-and-comer Marguerite Bennett (Batman, Lois Lane, Angela: Asgard’s Assassin) and illustrated by Antonio Fuso (Vertigo’s Girl Who Played With Fire adaptation). Bennett’s handling of Rebecca is dependent almost exclusively on narration. Terse, concise statements fill the caption boxes, demonstrating our protagonist’s efficiency and mindset throughout the operation. 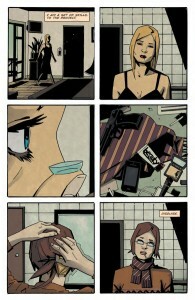 There is something compelling about “silence” in comics, particularly in the spy genre; often we assume these characters are cold-blooded or numb, but Bennett’s limited words lend an urgency and desperation to Rebecca. In lieu of abundant dialogue and exposition, Bennett instead relies on innovative staging and perspective in her script. As such, Butterfly #1 is really Antonio Fuso’s show. Fuso’s gritty naturalism (a la Michael Lark or Stefano Guadiano) is just as efficient and detailed as our protagonist. Fuso rapidly shifts perspective and “camera angle” on a single page, defining the limits of the environment in a given scene immediately and effectively. It’s almost as though Fuso’s artistic shifts in direction parallel Rebecca’s own visual read of her scene (think Sherlock). The botched operation scene is particularly engaging, as Bennett wisely allows Fuso to maneuver the players (and the readers) around the situation. Tonally, Butterfly owes much to the recent iterations of Black Widow under Marjorie Liu or Richard K. Morgan. The one distinction is that at no point does Bennett or artist Antonio Fuso emphasize or fetishize sexuality; the emphasis is not only on Rebecca’s skills, but on the tension and distress of her situation. I suppose in that regard, the latest volume of Black Widow under Nathan Edmondson and Phil Noto (who pulls cover duties for Butterfly) is an accurate comparison point for this book. The father-daughter core, however, pushes Butterfly into a very different thematic arena that any version of Black Widow, and Bennett and Amel make sure to frame their new series around this complex emotional theme. BUY. 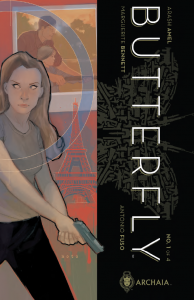 Butterfly #1 is a riveting addition to the resurgence of espionage books on the stands today. Following in the footsteps of Velvet and Black Widow, Butterfly tells an engaging, thrilling story with a female protagonist at the lead. 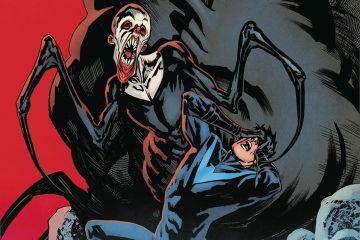 The father-daughter relationship that drives the first issue plays out brilliantly, and the final sequence is reason enough to tune in next month. Check it!!! !